Morning glories were the first flower I planted back at my parents farm. It was such fun checking every day to see its progress. Thanks for the memory! They're a sweet flower, but they take over terribly, and they come back the next year if they are allowed to go to seed. Sorry, I yank them up when I find them. Amy's got it right for me anyway. Yesterday was busy busy busy! The morning glories are lovely. Heavenly Blues, right? I have some of those and my grandma used to always have Heavenly Blues growing along the fence. Oh, I hear you. I used to get so infuriated by the way they sprouted up by the (seemingly) millions, practically strangling everything in the garden. They'll latch on to anything and just start climbing. BUT, I also love flowers, and that light blue is one of my favorite colors. So one year I finally calmed down long enough to get wise and follow the old "If you can't beat'em, join'em" saying. I made a tall teepee of bamboo poles for the morninglories to climb up in one of my garden plots. Ta dah! They were thrilled and so was I. In France, we call these flowers "talkative flowers" because they are talkative!!! I love Morning Glorys and good thing too. 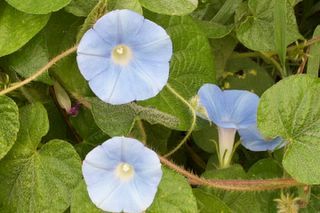 When we moved to this little cottage in town, June brought us Morning Glories all over the place. They covered everything. We just took up those we didn't want, transplanted some to the back but they are so prolific. I have pink, purple and large blue ones. They are just part of our home now.